ank and Vogue has one of North America’s largest availability of store return toys from one of the largest toy store chains. These toy store return products are available from four U.S. locations. These toys include store and customer returns, as well as items that are overstock or out of season. This ensures the toys are in great, working condition and perfect for wholesale resale. When the toys are processed for delivery any broken or unusable toys are discarded.Loads can include hard toys, such as cars, dolls and games and soft toys, such as stuffed animals. If you or your company are looking to buy wholesale toys we have the products for you. Bank & Vogue has been selling these loads around the world for over 5 years with many long-term, satisfied and returning customers. 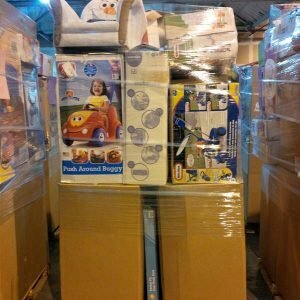 Contact the Bank & Vogue team today to purchase good condition, wholesale toys for you business throughout North American and internationally. All smaller store returned toys are packed in larger plain boxes, with many toys remaining in their original packaging. All loads are fully palletized and shrink wrapped for safe and easy transportation. Twenty pallets are loaded on a container with loose product placed on top to completely fill the container. All products must be exported directly from our North American pick-up locations, with some country exclusions and are not exportable to all countries. The Bank & Vogue team will work with you to confirm the requirements. If you’re looking for wholesale, overstock toy returns Bank & Vogue can supply you with high quality, store return toys. Contact us today to determine the logistics and ensure you receive the products you need in a timely and professional manner. Returned baby items are available from the same supplier and locations as our toy store returns. All products are baby related and can include baby clothes returns, walkers, strollers, swings, exercisers, bassinets, furniture and more. Bank & Vogue only buys and sells the highest quality baby items, ensuring the families and infants who receive them have nothing to worry about. If you’re looking to purchase wholesale baby products contact us today to begin the logistics process. When packaging all loads all medication and food products are removed. 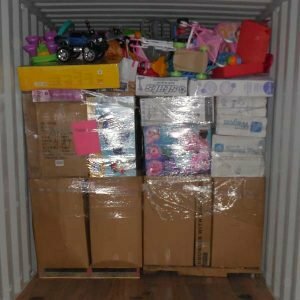 All our returned baby items must be exported from the U.S. with similar export restrictions as the toy return products. 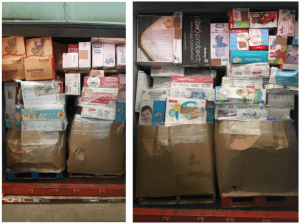 Each load includes twenty shrink wrapped pallets, plus loose baby items on top. Contact the Bank & Vogue team to get started or for more details.